This product has been replaced by the Super Chief Xtra 8 Amp (SCFX8) and is no longer available. Click here to view the SCFX8. 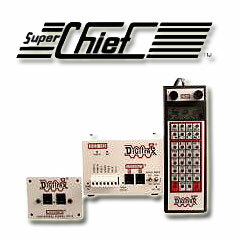 The Super Chief 8 Amp starter set contained a DCS200 command station, a DT400 throttle, a UP5 Universal Panel, and a LT1 LocoNet tester. In addition the Super Chief 8 Amp starter set was available as a Radio Equipped Set. The photo is of a 5 amp Super Chief. The 5 amp set contains a DCS100 as shown. The 8 amp set contains a DCS200 command station which is similar in appearance to the DCS100. Run up to 120 locos and 120 throttles in command station mode. Two DCC outputs so you can run your trains and program at the same time. Click encoders give extra fine speed control and direction control, too! Single key access to most common throttle tasks. No more throttle display time-outs!